Auralex's 2" Studiofoam Pyramids insulate small to medium-sized areas including iso booths, control rooms, and recording studios. The 12 included in this kit are 2' by 2', and their soundproofing material effectively kills standing waves and flutter echoes and, when used in conjunction with Auralex LENRD or Venus Bass Traps or our Sunburst Broadband Absorbers (all sold separtely), can effectively tame the full-frequency bandwidth in virtually any acoustic environment. 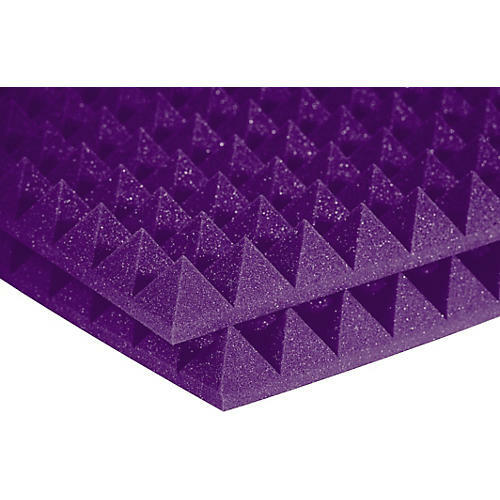 The Studiofoam Pyramids offer a bit of extra sound diffusion and slightly less sound absorption than 2" Studiofoam Wedges, so they yield a less dry-sounding space with a bit more "air." For installation, Studiofoam Pyramids require Auralex Foamtak spray adhesive (sold separately, - see #422605), which allows you to remove the foam later. For more permanent installation use Tubetak (sold separately - see #422606) or Tubetak Pro liquid adhesive applicators (sold separately - see #472436).